First let me state right out of the gate that this post, in my opinion, has nothing to do with anything negative or toxic about the specific product that I will be discussing here. I know there are those of the paranoid ilk who may not agree, but in my opinion the chemical of interest here is not toxic and is consumed by millions of people every day, whether they know it or not. So despite those admonishments from people chastising me for delaying this post, I didn't feel I was putting anyone at risk because I don't believe this chemical is harmful. So why am I even bothering discussing this? The reason is because this is the ultimate demonstration of hypocrisy in this marketplace and how people and companies will wage a campaign of fear when it suits their agenda. I think we will also see how people suddenly change their positions on the toxicity of said ingredient once they learn that their beloved savior has been feeding it to them for years. They will also be willing to overlook the fact that it was their company who originally told them this component was toxic. This is just the way things go when dealing with the brainwashed. 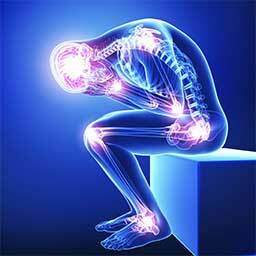 Amazingly, the said brainwashed will try to strike fear into people about using products with a safe ingredient like ethyl vanillin all the while they swill and slather aromatherapy blends from their messiah which contain significant amounts of toxic oils like Rue which contains high levels of some very toxic ketones. 1. They will deny to everyone that their product has this ingredient in it, try to cover it up, quickly change the formula and possibly sue anyone who makes the claim that this chemical is in their product. It's not really a wise choice to go this route as I am going to give instructions on how any lab can reproduce my results and with the large amount of this product on the market, any number of labs can reproduce my findings from a very simple procedure (so if you have this product, hold on to it, you may want it for your own court case if you believe its toxic). Nevertheless, this company is not very wise to begin with and so it would not surprise me at all if they try and go down this road, trying to discredit me in the process (as they repeatedly attempt do on a regular basis, but largely in vain as only the worst of the brainwashed actually believe them). 2. They will acknowledge that the product contains this chemical but deny that they ever said it was toxic. Of course they may be able to do this because perhaps they never said on any corporate site that it was toxic, I don't know. However it certainly was encouraged to their distributors to emphasize the supposed toxicity from journal article published in 1940 where massive doses in rodents were studied (details on this later). It was also published on the "certified synthetic" website which was forced to be taken down after said company was convinced to give up their ridiculous lawsuit (with a little extra persuasion in the form of analytical results on a number of their oils provided to their adversary by our team here at EOU). 3. They will accept responsibility, and apologize for spreading fear about a harmless flavor ingredient in order to promote an agenda. Can't see this happening, but it is technically a possibility. So now the details. First it might be helpful to review a little of the background to those who have not been following all this drama for the last couple of years. If you are brand new to essential oils or have been asleep for the last few years on what has been going on in the industry then you may have no idea what I am talking about and may need to ask a friend who is a little more up to date as to who these companies are to which I am referring. I thought about naming names for this one but I don't think its necessary as anyone can find out if they really want to and most people here are very familiar with this story already and so I want to keep with the values of this site of not mentioning any company names, primarily because there is no such thing as bad publicity anymore and secondly, one of these companies is like Voldemort to me and the utterance of the name in public is just bad energy to me. So where is the hypocrisy? A while back there was a large eo company, lets call them Company Y, who made accusations that their main competitor, lets call them Company D, was selling a peppermint oil that contained a trace amount of ethyl vanillin. For the record, we here at EOU analyzed said peppermint but were never able to detect ethyl vanillin in any of our tests. Nevertheless the claims were made and then the campaign of fear began. After the reports of ethyl vanillin surfaced we then saw various reps of Company Y spreading fear about how deadly and toxic ethyl vanillin was because of a 1940 article in the Journal of the American Pharmaceutical Association (Volume 29, page 425) entitled "On the Toxicity of Vanillin and Ethyl Vanillin for Rabbits and Rats" (just google that title and you will find websites with an actual copy of the article). In the study they fed massive doses of vanillin and ethyl vanillin to these rodents that are not even remotely in the sphere of the % level of consumption that a human would consume these flavor ingredients in food products. Anything is toxic in the right dose, whether its synthetic or natural is irrelevant. At the time all of this came out, many of you saw me comment on this multiple times. Even though I never saw ethyl vanillin in the peppermint oil from Company D, my biggest point, which most people seemed to ignore, was that, even if ethyl vanillin was in there at 0.07% or whatever (and I don't believe it was), who cares? I went on to inform people that ethyl vanillin was a safe, effective and very pleasant flavor ingredient found in many different products and consumed by millions every day. If you have ever eaten vanilla candy, ice cream, cake batter, icing, soft drinks, protein powders, etc. then you have ingested way more ethyl vanillin than you would ever hope to get from said peppermint with such a trace amount of claimed ethyl vanillin. After I made that post, it later hit me out of the blue when I was drinking a powdered vanilla protein mix that I got at a local grocery. PROTEIN POWDER!!!!!! 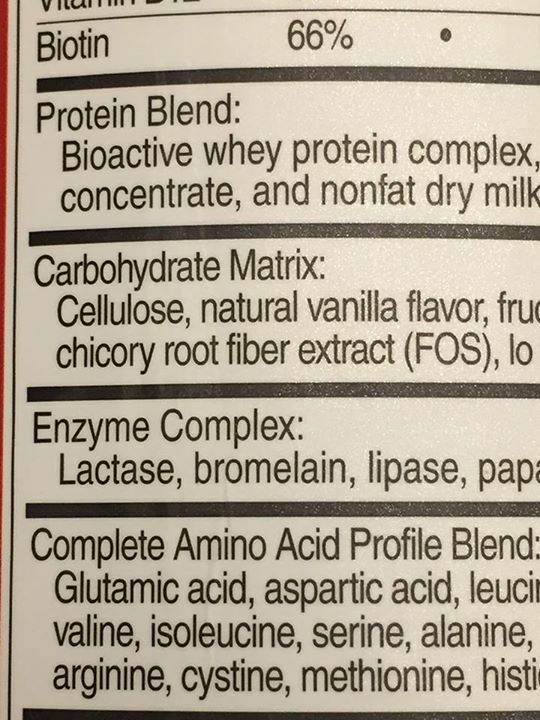 Doesn't Company Y sell their own brand of vanilla protein powder?? After a quick search on line, I confirmed that indeed they do! And knowing what I know about the flavor industry I just knew that they had to be using ethyl vanillin to flavor it. This is where it gets good. So the arrangements were made for someone to purchase some containers of the product from Company Y called "Pure Protein Complete" and have them shipped directly to me in unopened, untampered, sealed containers. Upon arrival the first thing I did was open the containers to smell them. 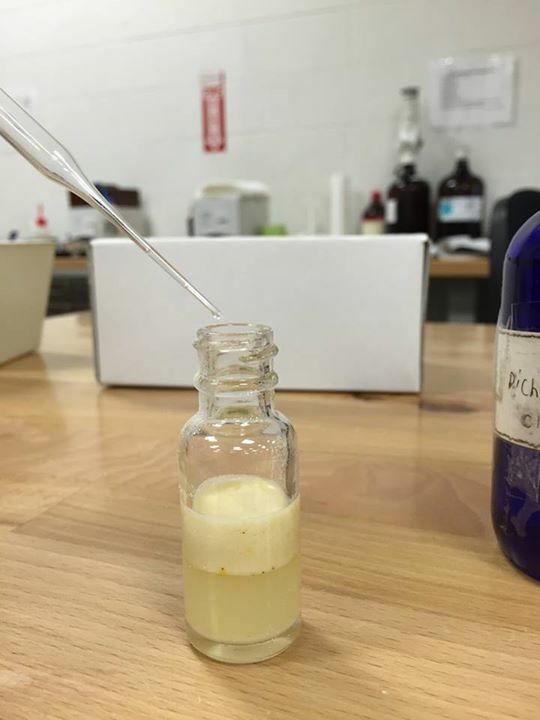 Having worked as a flavor and fragrance chemist in the past as well as a perfumer I am very familiar with the odor of ethyl vanillin, has a very nice and distinct aroma/flavor of wedding cake (in my opinion). As soon as I opened the container and took the first whiff I knew, without a doubt, that this product was flavored with ethyl vanillin. But just my olfactory opinion was obviously not enough to prove anything so I had to get it into a form that I could inject on the GC. Most of the powder is non-volatile stuff that won't dissolve in anything and won't come off on the column because its too heavy. 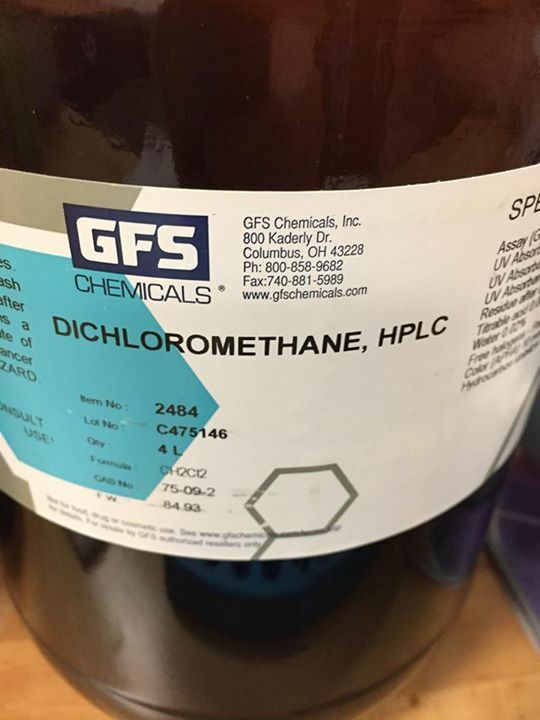 But by simply putting a few grams of the powder into some dichloromethane solvent, I knew that whatever ethyl vanillin was in the product would be easily extracted into the dichloromethane, with little else being pulled out of the mixture. 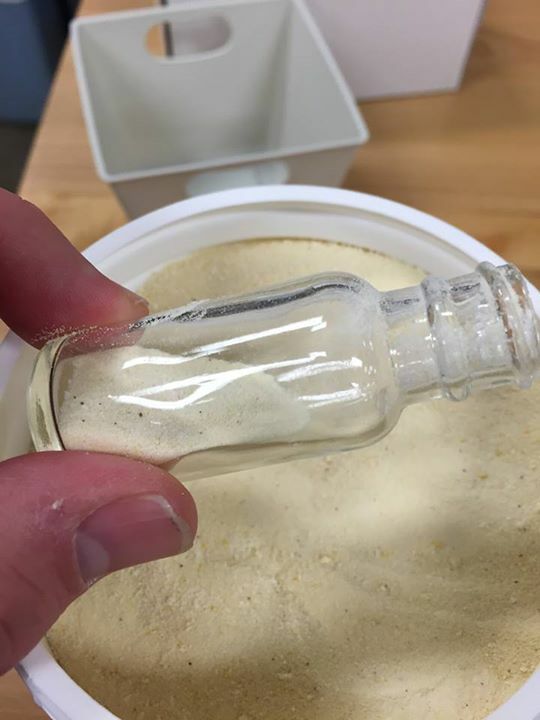 As you can see from the pictures I just took a couple grams of the powder and put it into a small glass bottle, then added enough dichloromethane to cover it all, capped the bottle, shake vigorously and then put in the microwave for 15 seconds to further facilitate the extraction. Just for added measure I let the powder set in the dichloromethane for a couple of days, shaking it up at various times along the way in order to make sure I extract as much of the volatile flavor ingredients as possible into the solvent. Then, after a couple days, I simply poured the mixture through filter paper to separate all the non-dissolvable solids from the liquid extract. Now for the money shot. 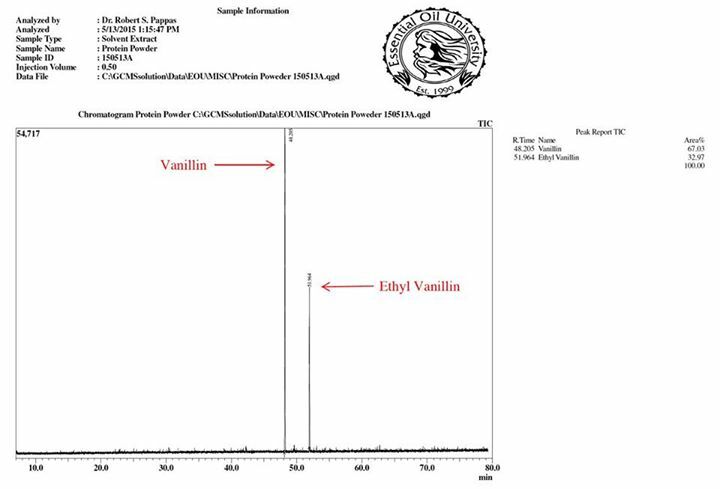 I ran the resultant extract on the GC/MS and as you can see in the picture, there were two very dominant peaks in the mixture, vanillin and none other than ETHYL VANILLIN!!! 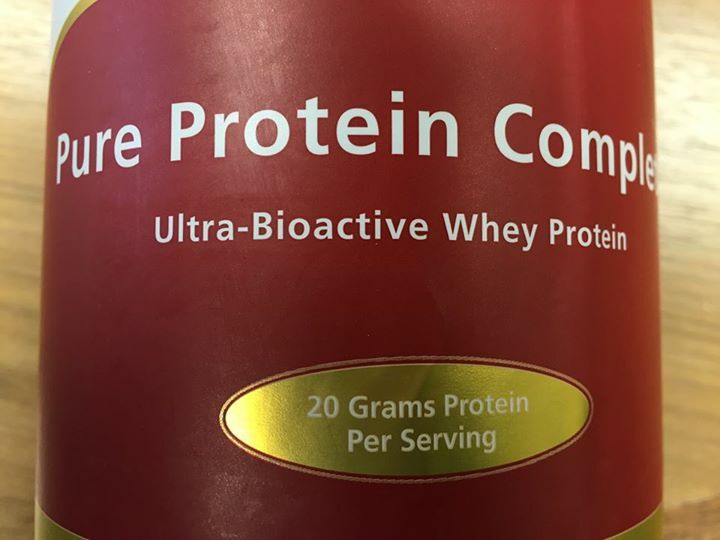 No question about this result, 100% certain in the identification based on the mass spectrum, retention time and odor, this protein powder is flavored with ethyl vanillin! So Company Y and their reps, who were so vocal and adament about the supposed "toxicity" of ethyl vanillin were actually selling, promoting, and most likely using a product designed specifically for human consumption which contained the deadly ethyl vanillin!! LOL This, to me, is the ultimate in hypocrisy. Finally, let me say once again that, personally, I find nothing wrong with this protein powder and it might very well be a good product. The fact that it has ethyl vanillin in it means nothing to me other than its exactly what one would expect for such a product. But many reps from Company Y have had such fear and criticism over the the mere claim of ethyl vanillin being in the peppermint of Company D that I thought they should be aware that if they really are afraid of this "devastating poison" known as ethyl vanillin then they might want to refrain from drinking any more of their own company's protein powder as well as stop eating all vanilla ice cream, candy, gum, soda, cake, pudding, etc. that they will inevitably encounter in everyday life. The other troubling piece of this equation is the fact that the ingredient list on this product clearly makes the claim of "natural vanilla flavor" as you can see in the last picture below. In case the reader is not aware, ethyl vanillin does not occur in nature so anytime you see it in a product its NECESSARILY from a synthetic source. Mysteriously the image of the ingredient list on the website of Company Y has now disappeared. Must be just some sort of computer glitch right? I now open the floor to all the flat-earther's out there for the denial and rebuke!